Cuisine and traditional food go hand in hand with traveling. Visiting a new country without indulging in its delicacies is almost equivalent to exploring a new destination through the window of a car without getting outside and touching the ground with your feet, smelling the air, interacting with locals. The traditional cuisine makes any travel complete and enriches you with the experiences that go from inside out. Literary! I was introduced to Nepalese cuisine by my husband who warned me upfront that it could be a “spicy” experience. Although in most cases it is true, you can always opt for milder options, which I gladly did. 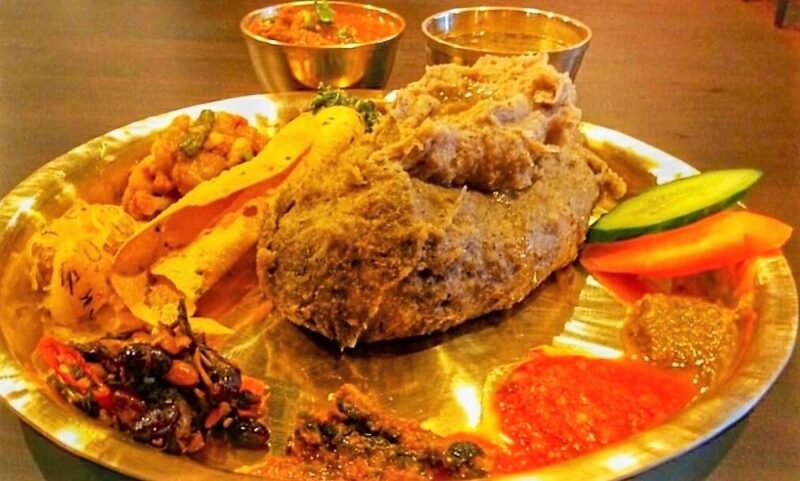 Somewhat similar to Indian and Bangladeshi food, the Nepalese cuisine is rich in flavor and taste. The use of abundance of different spices gives the food not only pleasant savor but also strong aroma that distinguishes any South Asian cuisine from other cuisines in the world. So let’s go ahead and sample some of the traditional Nepalese dishes. Staple food of the Nepalese throughout the whole country, dal bhat tarkari is not one dish but rather a combination of three different foods. The main ingredient is bhat or cooked grains such as rice, buckwheat, miller, barley or maize. The choice of the grain largely depends on the climate and part of the country where it is grown and eaten. Bhat is typically accompanied by dal, a cooked lentil soup with onion, garlic, ginger and spices and tarkari, a curry made from different seasonal vegetables with spices and curry powder. 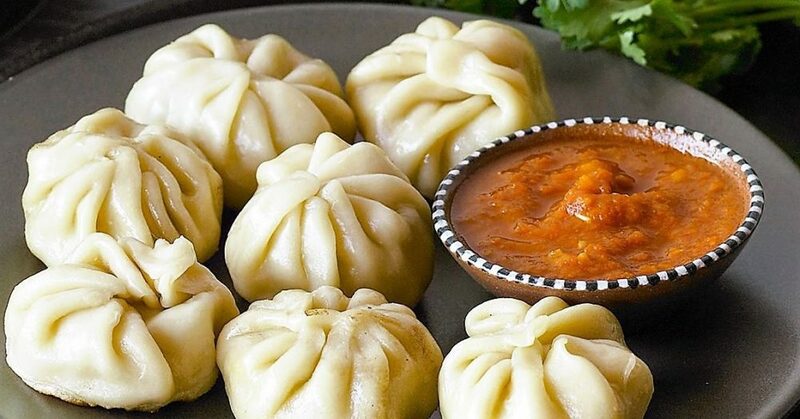 One of the most favorite foods of all Nepalis, momo is a steamed or fried dumpling-style dish filled with chicken, pork, buffalo meat or vegetables and often eaten as an appetizer. According to my husband, tomato-based source served together with the main dish is what makes all the difference. Adding its own unique taste, the source simultaneously brings out the rich flavor of the momo. When tasting this traditional dish, make sure to get the good source and dip your way through the plate of delicious Nepalese dumplings. Countryman or better to say countryfood of momo, thukpa originates in the mountains of Tibet. To keep themselves warm at high elevations, the mountain dwellers created the warming, full of nutrition dish that soon spread out to all parts of the country. Although highly enjoyed by most Nepalese, this noodle soup with vegetables, meat (originally buffalo meat), garam masala and chili is not what you want to eat if you are a vegetarian or vegan. Humble Dhido is another must-try food in the Nepali cuisine. The second popular food after Dal Bhat Tarkari, Dhido requires only two ingredients (water and wheat or maize flour) and is very easy to prepare. Bring water to boil and start adding flour continuously stirring them together. Cooked without spices, salt or oil, dhido falls into a category of highly health beneficial foods. It is often served with Gundruk soup or vegetable curry. Can you try a new cuisine without satisfying your sweet tooth with a traditional desert? I do not know about you, but I consider it a crime. I am a true believer that you absolutely must try the traditional sweets when you visit a new country. When in Nepal, sel roti, a sweet, ring-shaped bread prepared by deep frying rice flour, is the dish that satisfies your sweet cravings and presents you with the cultural experience at the same time. Once tried, the Nepali cuisine remains one of your favorite. Just the thought of these Asian culinary masterpieces makes my mouth water. 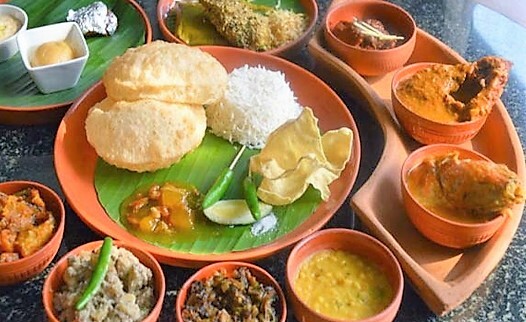 Have you tried any of these traditional dishes? If so, which is your favorite? 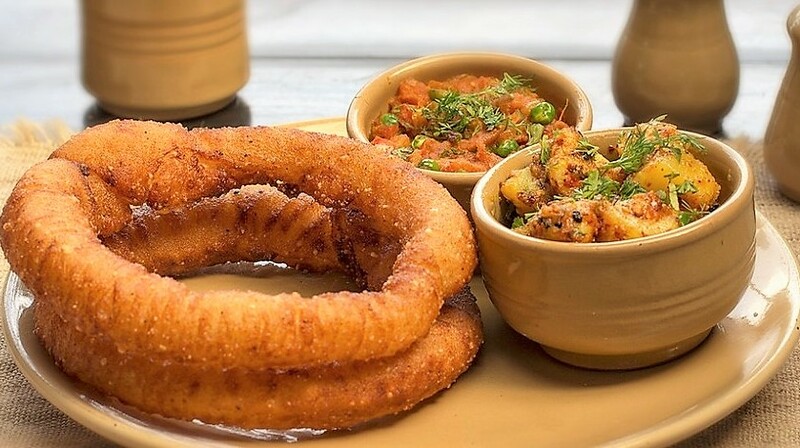 This food looks and sounds delicious – I particularly want to try momos and sel roti! I was inspired by your last vegan food post and went out to try some international dishes. I actually had a Vegan Momo dish stuffed with spinach and mushrooms and it was so delish! Happy new year! Oh wow, Caroline! Thanks for sharing. I always say that trying international cuisines, you don’t have to compromise with your preferences or taste of the food. There are so many healthy, delicious dishes in every cuisine. So many nice foods, I’ve tried some of these dishes but the Indian version. Now I want the Nepali version upon seeing these photos!!! These all look SO yummy! And I love how many of them are plant based. That dessert looks delicious! But honestly, I’d want to try them all! Experiencing culture through food is my all time favorite! I have never tried any of these but each one sounds so tasty and delicious =o) I love trying new cuisines especially when I travel! Trying new cuisines undoubtedly teaches a lot about cultures, customs and traditions. I can’t imagine traveling to a new place without getting a taste of their food. Omg all of these look so tasty! Especially that Momo. I love anything / everything that’s like dumplings! Wow, these dishes look and sound amazing! I’ve never tried them, but I definitely want to!